David William Sime was born July 25, 1936 in Paterson and grew up in Fair Lawn. Few doubted he would make his mark in sports, but initially it looked as if the sport might be figure skating. At the age of 13, Dave won the Silver Skates competition at Madison Square Garden and appeared on the Ed Sullivan Show. Long and lanky, with lightning quick reflexes, great hand-eye coordination, and a shock of red hair, Dave soon became known for his baseball-playing prowess. He batted over .400 all three varsity season at Fair Lawn High and hit two homers against a Cuban pro team in an exhibition at the Polo Grounds. He later turned down a bonus to join the Giants out of school. Although Dave was the fastest athlete in his high school, he never ran track, as the season conflicted with his diamond interests. Dave was also a member of the Fair Lawn High football team. He led the squad to a state title as an All-State single-wing tailback, kicker and punter. Vince Lombardi tried to recruit Dave for the United States Military Academy. In a 60-yard time trial, Dave broke the Army track-team record for that distance. Dave had thought about becoming a pilot, but during his visit to West Point he learned he was color blind, so his enthusiasm dimmed for a career in the military. Dave subsequently turned down Princeton and Notre Dame before accepting a baseball scholarship to Duke University. While warming up as a freshman, Dave was spotted by the school’s track coach, Al Buehler. Ace Parker, the former NFL star, was coaching baseball at Duke. He gave Dave permission to work out with the track squad when the Blue Devils weren’t playing. In his first track meet, against Maryland, Dave ran the 100 yard dash in 9.6 seconds—just .3 seconds of the world record. He would later equal that record as a Blue Devil, and set a world record in the 220, which he ran in 20 seconds flat. In 1956, Dave was the talk of the running world. 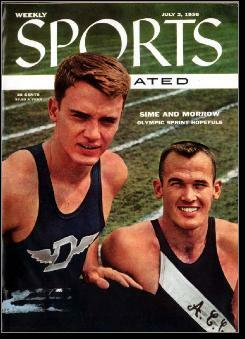 He and Bobby Morrow engaged in thrilling duels as the two headed toward Olympic glory. Sports Illustrated called him Superman in Spikes. Alas, a torn groin muscle derailed Dave’s planned trip to Melbourne. He suffered the injury while horseback riding. Meanwhile, Dave returned to Durham looking for new challenges. In the spring of 1957, he rejoined the baseball team and led the ACC with a .357 average. Dave also made the Duke football varsity as a split end. In his first game, against powerhouse Notre Dame, he sped past defenders on the game’s opening play for a touchdown pass. On the team’s next offensive possession, he caught another TD pass. The Fighting Irish finally caught on a triple-teamed Dave, but it was too late. Duke won the game. Dave was drafted by the Detroit Lions after graduating in 1959, but he was now focused on the Olympics. In a meet prior to the Summer Games, he ran the 100 meters in 10 seconds flat to set a world record. In Rome, Dave won a silver medal in the 100 meters—placing second in a photo finish and ran the anchor leg of the 4 x 100 relay. An apparent victory in this event was erased because of a pass that occurred outside the zone between Dave and Frank Budd.